To promote the releasing of MDNA, her new album, Madonna answered Twitter messages for a single time today during almost one hour and a half. In her messages, among other things, the American singer told her followers that she is not vegetarian because he loves and needs protein, that the language she most wants to learn is Hebrew, and that a horse was one of her favorite birthday presents ever. 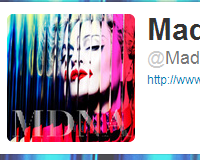 The Twitter username of the singer was @MadonnaMDNAday and in the moment when she said goodbye she had almost 35,000 followers. There are no news about when she will use Twitter again. UPDATE (April 2, 2012): the account used by Madonna on Twitter now informs that she will answer questions again next April 4 at 10pm ET.